This month we decided to do a special music edition of D”ash, the international youth magazine that I edit for the Jerusalem Post. We figured August is usually a slow time for news, so why not make it pop (quite literally)? 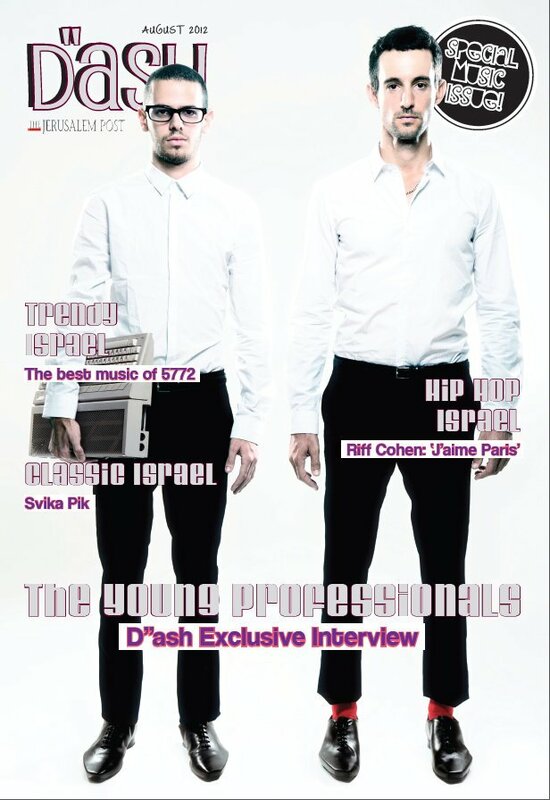 Below is the cover story/interview I did with TYP, a great Israeli up-and-coming electropop group. In fact, they’re so up-and-coming that Universal signed them for a three-album record deal. To boot, for those of you that don’t speak Hebrew, no problem: all their lyrics are in English! I am pretty proud of this interview, also because it was one of the first interviews I’ve done in Hebrew (another step towards acculturation; check!). As always, let me know what you think. D”ash interviews the most hyped Israeli band of 2012. Last year, The Young Professionals (or TYP for short) won Best Israeli Act at the MTV Europe Music Awards. This year, they signed a three-album deal with Universal. What makes this electropop duo, formed by veteran Israeli music scenesters Ivri Lider and Johnny Goldstein, such an international success? Besides their infectious melodies, catchy beats, and English lyrics, it probably has something to do with men in heels, campy dancing, and multi-layered videos. Part of TYP’s tagline is “We create something new, always based on something old.” “D.I.S.C.O.”, their hit single, is a great demonstration of this concept. The song is an obvious homage to the Disco era, but the music video has various visual and musical influences. The girls that dance in the beginning are a colorful, hipster take on Robert Palmer’s “Addicted to Love”, also known to some as “that 80s video with models that look bored and fake play the guitar.” The girls here play keytars, and the song itself has a mix of 80s and indie electronic beats. So in one seemingly simple pop song, TYP takes us all the way from Disco, to the 80s, to today! Despite their impressive musical mastery, their real secret weapon is Uriel Yekutiel, their dancer. Extremely flamboyant, he is usually dressed in women’s clothing and heels, and often leads cheesy, choreographed group dances. His enthusiasm really brings the group to another level. First, he strengthens TYP’s connection to the LGBT community; Ivri Lider, himself openly gay, also sings frequently about relationships with men. But I also imagine that his energy makes their dance hits even catchier, helping TYP cement itself as a powerhouse on the electronic dance floor. This catchiness is also a large part of what has made them an international sensation. Uriel doing signature campy dance in a TYP music video. D”ash was thrilled to chat with this emerging pop duo. Similar to their videos, where Ivri sings while Johnny stares into the screen and occasionally taps his foot, Ivri was the bigger talker. What led you to form TYP in the first place? Ivri: The connection started about a project that featured many different artists but eventually, it didn’t come out. Then we played one year together for fun. And we didn’t plan all this, but we started to develop what we did together, and we found out that there was something tangible and wished to do something with it. Then we came up with TYP, which in its concept, is more than a band. What is the importance of multi-media collaboration in TYP’s concept? Ivri: It’s of huge importance. We don’t view it as mixing multi-media, but as one thing. And our band is a part of it. There are two musicians, a graphic designer, and a stylist as well. It’s more than the music. Music is an experience that combines all your senses. It’s not only what you hear, but also what you see. It’s about everything – what you wear, what you see on stage. It’s a total experience. What impact has signing with Universal Music Group/ Polydor Records had on your lives? Ivri: I think that when you get connected to a huge body like Universal, it’s a very powerful bond because it allows us to do a lot of things. They have thoughtful and creative feedback that is really fun to accept. They have a great understanding of the market and it feels really good to collaborate with them. Basically, it enlarges our abilities – it allows us to do more. Part of Universal’s feedback was to first release TYP’s debut album 9:00 to 17:00, 17:00 to Whenever in France (it was released in June). Why did they choose France first? Ivri: I think that France is a center for electronic music. The scene and especially the live music scene are very developed. They are very intelligent and stylish. They like things that are chic and special. You said in an interview recently that, “We like opposites… we feel all those opposites is something in our everyday life.” This is reflected in different styles mixing within your music and videos. How much of this attitude comes from being Israeli? Ivri: Yes, I think it’s a lot about being Israeli. There are all these extreme opposites that exist within Israel. You can find almost any opposites: within the economy, the music, that there’s liberal women walking down the beach in Tel Aviv and at the same time you have a woman walking down the street in Beit Shemesh that’s getting spat on. The fact that there’s also a war two hours from here, and clubs in Tel Aviv. Part of it is also feeling like we live in a world where we have so many things. It’s part of also being Western people. That’s interesting to hear your examples because they’re all parts of why living in Israel is stressful. But your music is really fun. Do you think that’s also part of being Israeli? Ivri: We live in such a stressful environment that we don’t even notice it anymore. I definitely think the whole “party party” thing, especially in places like Tel Aviv, is a response to that stress. You know better than anyone (referring to said reporter) because you’re an olah chadasha (new immigrant) how stressful life can be in Israel. My boyfriend’s also an oleh, from Germany, and I see it through him how stressful life is here. What do you want us to remember from this interview? Ivri: The fact that this is such a unique idea that is going to conquer the world! TYP may not be conquering the world yet, but they will be performing in Paris and a few summer festivals in Europe. After that, we’ll see what Universal has up its sleeve: D”ash hopes this fun, thoughtful, artistic duo will go far. Sivan Azulay and Tal Lado contributed reporting.